Cuts, Scrapes (skinned knuckles) and Bruises. These are the most common injuries. Jammed Finger. 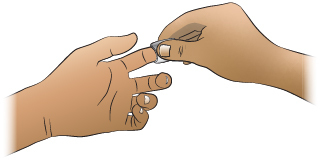 The end of a straightened finger or thumb receives a blow. Most often, this is from a ball. The energy is absorbed by the joint surface and the injury occurs there. This is called traumatic arthritis. For jammed fingers, always check that the fingertip can be fully straightened. Crushed or Smashed Fingertip. Most often, this is from a car door or a screen door. The end of the finger may get a few cuts or a blood blister. Sometimes, the nail can be damaged. Broken bones are not common with this kind of injury. If they do occur, they are at risk for a bone infection (osteomyelitis). Fingernail Injury. 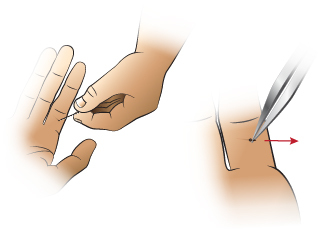 If the nailbed is cut, it needs sutures to prevent a deformed fingernail. Subungual Hematoma (Blood Clot under the Nail). Most often caused by a crush injury. This can be from a door crushing the finger. It can also be from a heavy object falling on the nailbed. Many are only mildly painful. Some are severely painful and throbbing. These need the pressure under the nail released. A doctor can put a small hole through the nail. This can relieve the pain and prevent loss of the fingernail. Dislocations. The finger has been pushed out of its joint. Fractures. Finger has a broken bone. Mild: your child feels pain and tells you about it. But, the pain does not keep your child from any normal activities. School, play and sleep are not changed. Moderate: the pain keeps your child from doing some normal activities. It may wake him or her up from sleep. Severe: the pain is very bad. It keeps your child from doing all normal activities. There are many ways that children can hurt their fingers. There are also many types of finger injuries. You can treat minor finger injuries at home. To help with the pain, give an acetaminophen product (such as Tylenol). Another choice is an ibuprofen product (such as Advil). Soak in cold water for 20 minutes. For any bleeding, put direct pressure on the wound. Use a gauze pad or clean cloth. Press down firmly on the place that is bleeding for 10 minutes. This is the best way to stop bleeding. Keep using pressure until the bleeding stops. Wash the wound with soap and water for 5 minutes. For any dirt in the wound, scrub gently. For any cuts, use an antibiotic ointment (such as Polysporin). No prescription is needed. Cover it with a bandage (such as Band-Aid). Change daily. Caution: Be certain range of motion is normal. Your child should be able to bend and straighten each finger. If movement is limited, your doctor must check for a broken bone. Soak the hand in cold water for 20 minutes. If the pain is more than mild, "buddy-tape" it to the next finger. Wash the finger with soap and water for 5 minutes. Cover it with a bandage (such as Band-Aid). For a cracked nail without rough edges, leave it alone. For a large flap of nail that's almost torn through, cut it off. Use a pair of scissors that have been cleaned. Cut along the line of the tear. Reason: Pieces of nail taped in place will catch on objects. 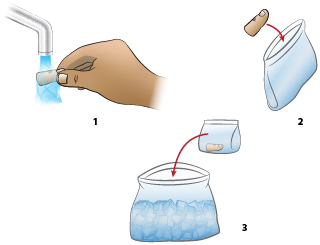 Soak the finger for 20 minutes in cold water for pain relief. Use an antibiotic ointment (such as Polysporin). No prescription is needed. Then cover with a bandage (such as Band-Aid). Change daily. After about 7 days, the nailbed should be covered by new skin. It should no longer hurt. A new nail will grow in over 6 to 8 weeks. You can remove splinters, larger slivers, and thorns with a needle and tweezers. Check the tweezers beforehand to be certain the ends (pickups) meet exactly. (If they do not, bend them.) Sterilize the tools with rubbing alcohol or a flame. Clean the skin surrounding the sliver briefly with rubbing alcohol before trying to remove it. Be careful not to push the splinter in deeper. If you don't have rubbing alcohol, use soap and water, but don't soak the area if FB is wood (Reason: can cause swelling of the splinter). Step 1: Use the needle to completely expose the large end of the sliver. Use good lighting. A magnifying glass may help. Step 2: Then grasp the end firmly with the tweezers and pull it out at the same angle that it went in. Getting a good grip the first time is especially important with slivers that go in perpendicular to the skin or those trapped under the fingernail. Apply direct pressure to the entire wound with a sterile gauze dressing or a clean cloth. Step 3: Place plastic bag containing the part in a container of ice (to keep cool and preserve tissue). Note: Take patient and amputated part to emergency department immediately. Common Medical Conditions What's Going Around? Having trouble figuring out screen time with your children?